Staff amid the captivating range at Annie's Provedore and Produce Store. 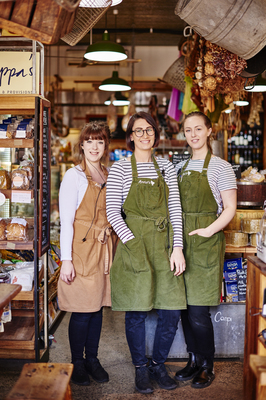 Annie’s Provedore & Produce Store achieved a rare feat when it was named a finalist in five categories at the 2018 Geelong Business Excellence Awards. The store’s excellence was acknowledged with placings in the Best First Year Entry, Regional Business, Tourism and Hospitality, Small Business and Retail Business categories. Annie’s describes itself as “a unique cafe and deli store” at Barwon Heads. The store serves breakfast, lunch and dinner along with pantry staples ranging from local oils and jams through to cheeses and prosciutto. Established in 2004, Annie’s has become a renowned and highly respected brand due to the high level of customer service and extensive gourmet food lines on offer. “Annie’s is the go-to cafe for locals, visitors and foodies … looking for that complete dining and entertaining experience,” writes owner Andrea Orchard in the store’s awards entry. “Serving authentic Italian coffee and French pastries, along with our unique ambiance, is what makes Annie’s stand out from the rest. The business now expanded into other ventures including Annie’s Kitchen, Catering and Events, in 2014 and Annie’s Italy Venetian Food and Wine Tours, in 2016.